Out of all the wellness phenomena that deserve a “womp womp”—getting dizzy during yoga class, retinol-induced skin redness, avocados that go brown when you turn your back for ONE second—turmeric stains have to be one of the most distressing. Perhaps you accidentally splattered some of your turmeric face mask onto your white shower curtain (been there)—or maybe your Lyft hit a pothole and you sloshed your golden latte all over your new fleece bomber. As you may have learned the hard way, the orange-yellow marks left behind by this vibrantly-hued root can be permanent if you don’t act fast. (Blame curcumin, the active compound in turmeric that makes it so anti-inflammatory.) But luckily, they are potentially reversible—unlike an overripe avo. For guidance on what to do when turmeric stains strike, I turned to a few people who deal with this issue on the reg: healthy chefs. And as it turns out, the fix involves ingredients that you’ve probably already got in your kitchen. “My favorite way to remove turmeric stains is white vinegar, dish liquid, and water,” says Ayurvedic chef and lifestyle expert Sahara Rose, author of Eat Feel Fresh: A Contemporary, Plant-Based Ayurvedic Cookbook. “Just dilute 1/2 cup of white vinegar with 1 cup of water and 2 tablespoons of dish liquid. Dip the fabric in the mixture and let it sit for 20 minutes. 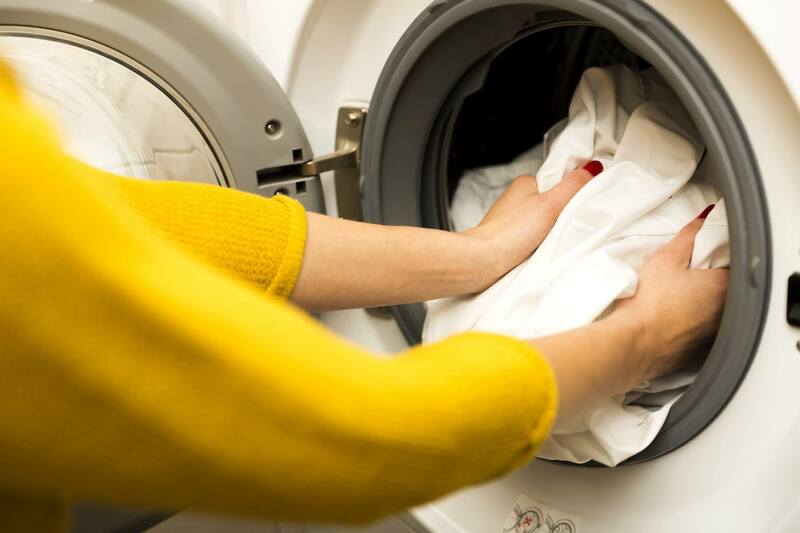 Rub the stain to dislodge it, and then wash it in the laundry.” For the final step, she recommends letting your item dry in the sun, as sunlight is known to naturally zap turmeric stains. And what if you get a turmeric stain on your clothes while you’re out and about, without access to vinegar or dish soap? Find a lemon slice ASAP and dab its juice on the stain—you can find one at pretty much any restaurant and it’ll work as a natural bleach, says Maeve Richmond of home organization company Maeve’s Method. Then, do the full stain-removal process when you get home. Fashion crisis, averted. Now that we’ve assuaged your fear of turmeric stains, use it to make this pumpkin quinoa oatmeal and vegan pumpkin soup.